Metabolic Advantage?! A Calorie is a Calorie. The low-carb crowd will convince you that “carbs make you fat”, and they’ll tell you about all the heavy whipping cream, lard, and cheese they consume. They’ll say that “a calorie is not a calorie”, and make it seem like you can eat a lot more under a low-carb diet. I’m pretty sure all the studies continue to show that “a calorie is a calorie”, and the non-statistically significant differences between a low-carb and low-fat (high-carb) diet depend more on adherence, and differences in actual calories consumed. Just to make sure, I checked with an online ketogenic diet calculator, using my particulars (age, weight, height, physical activity). So, even if I starved myself to only 25g of carbs a day (vs. my current 400g/day), then I could eat 100g of protein, and 212g of fat. 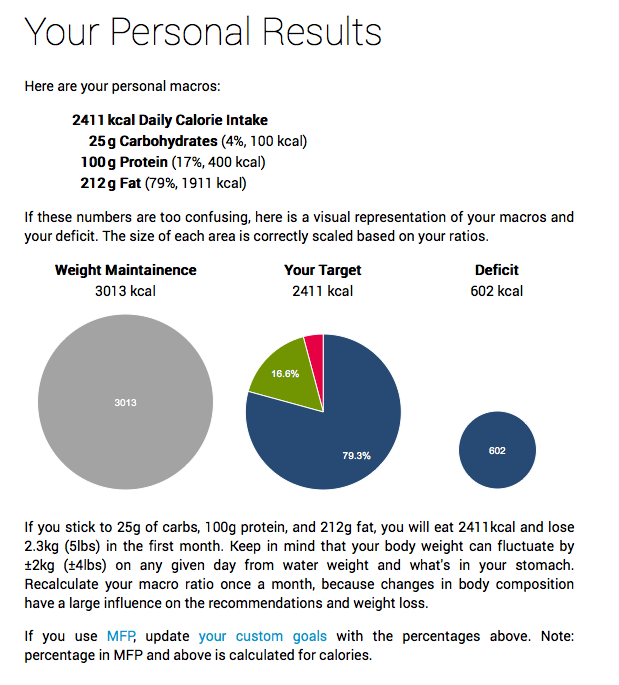 It calculates I’d only lose 75g/day. Where’s the metabolic advantage of a ketogenic diet? I already lose 100g/day eating 2 lbs of starch everyday. I’m happy with the 50g of fat I’m already eating. So why would I cut out carbs entirely? Because I was afraid of them? !